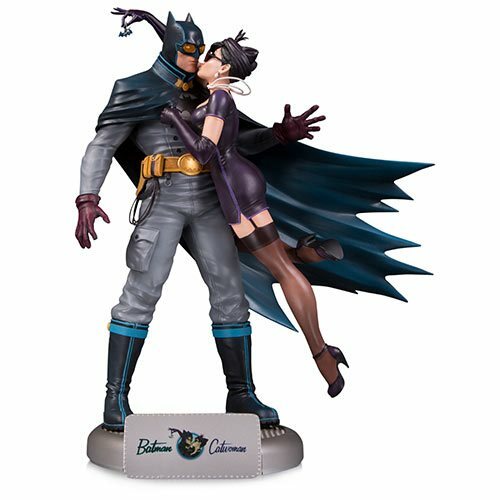 Batman and Catwoman display their epic love in three dimensions! The Dark Knight makes his Bombshells debut! Limited edition 11 3/4-inch tall polyresin statue. The biggest couple in comics comes to the DC Bombshells statue series! Batman and Catwoman display their epic love in three dimensions as the Dark Knight makes his Bombshells debut in this amazing piece. The 1940s-style 9-inch tall polyresin statue is a limited edition of 5,000 pieces that includes a DC Bombshells base and nameplate. Together, the DC Bombshells Batman and Catwoman Deluxe Statue and base measure approximately 11 3/4-inches tall.